Many puppies “piddle” when excited or nervous, but when this behavior continues into adulthood, your dog can be defined as a “submissive urinator.” This problem, more commonly seen in females, can be embarrassing as well as frustrating, but fortunately there are steps you can take to correct this problem. Before beginning any type of behavioral modification training, have the dog examined by the veterinarian for possible medical reasons. Disease and illness can make it difficult for the dog to control urination as can physical abnormalities. If the cause is medical, treatments such as surgery and medications may cure the problem. If a physical abnormality is not treatable, coping mechanisms such as diapers may be in order. If your dog is found to be healthy the problem is most likely behavioral. In order to understand the behavior, you must understand the pack language of dominance and submission. Timid animals that do not wish to appear as if challenging a dominant member of the pack will roll on their back and urinate. This is proper behavior among pack animals and expresses submission. This is not “bad dog” behavior, spiteful or deliberate, but is simply a message stating “you are my boss, I will not challenge you.” Understanding this behavior can go a long way in helping you correct the problem. Since the dog is naturally submissive, training based on encouraging submissiveness is unnecessary and will only make the problem worse. Disciplining the dog for uncontrolled urination only tells the dog you are still trying to dominate. His response will be to submit more, exasperating the problem. When dealing with this type of personality, negative enforcement such as scolding and punishment should be avoided at all cost. Instead, use positive reinforcement when training your dog with treats, lots of praise and encouragement. Obedience training can help build your dog’s confidence making him feel less threatened. Make his training fun with lots of play time. In situations that prompt submission, use a distraction or downplay the greeting. Tell other people to ignore the dog for a few minutes until he settles down. When arriving home, distract the dog with a ball or treat upon entering the house, or ignore the dog completely until it is calmer. Work in gradual steps and don’t expect too much right away, and remember, be patient because accidents will happen. The easiest and best way to prevent inappropriate dog behavior such as destructive chewing or house breaking or training accidents is with the use of a dog crate. Crate training a dog allows you to leave your home, sleep through the night or work uninterrupted knowing your dog’s behavior is under control. These “playpens” prevent your dog from potentially hurting themselves or getting “into trouble” within your home. A dog crate is also a safe way of transporting your dog in the car. It is very instinctual for dogs to want to retreat to a “den-like” area. If you properly teach your dog to use the crate, they will think of it as their safe place and will be happy to spend time there when needed. Dog crates should be introduced to dogs in a very positive manner. 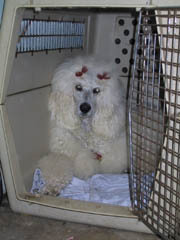 To help dogs feel at home in their crate, it is important not to use the dog crate as punishment or discipline. Make sure that your dog’s crate is located in a central area within your home, where they spend most of their time. It can be comforting for your dog to have a soft towel or blanket in their crate, as long as they are not destructive with it. Each time your dog walks into their dog crate, they can get a special, tasty “crate treat.” If yo ur dog only gets that special treat when they are in their crate, they will look forward to going into their crate! The crate is a secure retreat for your dog and also the key to successful and fast house-training. Dogs naturally do not like to soil in the area where they must sleep and eat. In order to keep their sleeping area clean, dogs teach their own bodies how to physically “hold it” when they need to eliminate. Once this important concept is learned, it is our job to follow the necessary steps of successful house-training when our dogs are out of their crate. There’s a popular saying among dog trainers: “There’s no such thing as a bad dog.” While that may be true, any trainer will admit that there are dogs with very bad habits. Simply put, behavior is a way of acting and reacting. When a dog acts or reacts to a situation in a way that has a negative impact on her owner or others, the behavior is considered to be “bad.” Yet, to the dog, it’s just what she does. Eliminating a bad behavior requires training to give the dog a new behavior, or habit. One of the most common bad behaviors is jumping up on people. This habit is established when a dog is a puppy. Puppies jump at their mother to get her attention so she will feed them. Dog owners find it adorable that their puppy works so hard to get their attention as she jumps. The naive owners come down to the dog’s level or pick the puppy up, not realizing they have just rewarded the dog for jumping and barking. Unfortunately, behavior that is cute in a puppy often becomes annoying in an adult dog. Large dogs that jump on people for attention easily knock down and accidentally injure children and older people. Small dogs have less ability to injure someone, but usually dirty clothes and snag stockings. In both cases, while you might not mind your dog jumping up on you, other people probably don’t feel the same way. Training your dog to sit to be petted is the easiest way to break the jumping habit. To help her develop the “sit for attention” habit, you must ignore her when she jumps on you. You might turn your back or simply walk away. If she follows you, turn quickly and tell her to sit. If she does, pet and praise her. You can reinforce this behavior by having her sit before you put her food bowl down. Every time she sits, she gets a reward of either attention or food. Every time she jumps she gets nothing. Never pet or coddle a dog to stop the bad behavior. You are only reinforcing the bad behavior. Digging is a natural, instinctive behavior in dogs. The most well known reason dogs dig is to bury or retrieve bones or treasured toys. On hot days, some dogs naturally dig and lay in a hole to escape the heat. Breeds such as terriers were bred to dig up and kill rodents and other vermin, and haven’t lost the instinct. In some cases, digging may be a dog’s way of trying to escape either physical confinement or boredom. While we know digging is instinctive in our pets, we sometimes can’t help but wish they wouldn’t do it. Compulsive diggers and dogs that dig excessively are frustrating. Their owners don’t want to punish their pets for doing what comes naturally, but they also don’t want their yards to be covered by craters. Luckily, there are ways to reduce and even stop dogs from digging. Before you can treat the behavior, you need to understand your dog’s reason for digging. Does she only dig when left alone? Does she always dig in the same spot? Is she digging under a fence? Does she tend to take her rawhide chews outside the minute you give them to her? Answering these questions can help you determine the right approach to take in training your dog. If your dog digs only when she is left alone for long periods of time, she is probably trying to alleviate her boredom. A good physical workout before you leave will tire her out so that she sleeps part of the time you are gone. Be sure to equip her with toys that engage her mind as well as her body, so she can stay busy when she wakes up. Pet supply stores have an amazing array of chew toys and dog “puzzles.” These are hollow cubes or balls into which you place small pieces of treats. Your dog will be able to smell the treats inside, and must figure out a way to get to them. Usually, this requires nosing and rolling the puzzle until a treat falls out of one of many small openings. Another way to deal with a digging dog is to channel her behavior to an acceptable spot. Some dog owners create special digging pits for their dogs. These are small areas of soft dirt in which the owners bury treats. Some are placed deeper than others, so that dogs have to use their sense of smell to find the treats. To make this technique successful, bury treats on an irregular basis, and never let your dog see you placing them in the dirt. You may have to make an extra effort with very compulsive diggers. If your dog repeatedly digs in a favorite flower bed, you might need to put up a physical barrier to prevent her from gaining access to the spot. Remote punishment is another technique that sometimes works well. This is simply something-a blast of water, for example-that distracts the dog the moment she begins to dig. Some people suggest that the owner distract the dog personally, either with a blast from a squirt gun or by shaking a can of coins. However, this is only feasible if you are with your dog constantly. Your dog may stop digging in your presence, but she will likely continue to dig. Another unpopular behavior is chewing. Destructive chewing is most often an indication your dog is bored. If your dog chews up the couch cushions or destroys a wicker chair while you are at work, it is probably because she had nothing else to do. If you look up from a book or television to find your dog chewing on your favorite shoes, realize that she is releasing pent-up energy. Give your dog the chance to exercise her body and brain. Plenty of physical exercise will tire her out so that she naps while you relax. Pet supply stores carry a variety of toys that provide mental stimulation-doggie puzzles to keep your pooch busy while you’re away. Also, if your dog is a chewer, make sure you give her chewing toys of her own. It is never a good idea to give your dog an old shoe or sock to chew on; she can’t tell the difference between your favorites and your discards because they all smell like you. Scenerio 1: You and your family sit down at the table to eat dinner. Your normally well behaved pooch is under the table nuzzling everyone or sitting at the corner of the table whining and begging. If either of these scenerios fit your dog, you DO NOT have a dog behavior problem. This is a PEOPLE behavior problem. Dogs learn to beg (and it is a learned behavior) because they are rewarded for their behavior. It is a TRICK they learn very quickly. Sound silly? – Think about it. The fact is, most dogs that eat a given amount of people food become obese, less mobile and die younger, the ultimate result of a trick well learned. Correcting the behavior is really not that difficult if EVERYONE agrees to abide by the rules. Place a mat or bed away from the table but within your view. Your pet can watch you eat from a distance. Teach your dog the “down” and “stay” commands and reinforce this “new trick” regularly throughout the day. You can then teach him the “place” command by showing him that “place” means to go to that spot and “down” “stay.” After a while, the “place” command is all you will need. At meal time, give the “place” command and reinforce it with praise. Don’t scold or correct your dog for getting confused. Remember that the begging was a trick you taught him. If the dog comes to the table, give a firm “NO” and a kind reinforcement of the “place” command. After you finish eating, release him and feed your dog his regular kibble, away from the table, in his regular bowl. Why feed him last? ; Because in pack behavior, the leaders eat first. By eating before your dog eats, you are telling him that YOU are the master. It should only take a few days for the behavior to be corrected, but remember, EVERYONE must agree and stick to the training. Visitors must also be told not to feed the dog. All it takes is one person to sneak food under the table, and all your work is undone. Traveling with your dog can be fun and exciting, or it can be disastrous. Planning ahead is the key to a successful trip and these guidelines can help. “Buckling Up” is not only for people but for dogs, too. Unrestrained dogs can cause an accident by distracting the driver, and in an accident, will become a projectile. Pets also can bolt from a car and get lost in an unfamiliar area or run out into traffic. Purchase a dog crate or dog seat belt and include their use in your practice runs. Consider applying a flea, tick preventative and repellent to protect your dog from diseases such as heartworm, West Nile Virus and Lyme Disease. I am not in the habit of recommending a single product, but in this case, I make an exception. There are many such products found in stores but in my many years experience as a dog groomer, most of these are not effective. The only products that work ALL THE TIME are the veterinary applications such as Frontline and Advantage. For many years these were only available through your Veterinarian. You can now purchase these products without a prescription online saving you valuable time and money. The newest of these products is called Advantix. This is the one we use and highly recommend. It not only kills fleas and ticks but also repels mosquitoes that can carry West Nile Virus. Make sure your dog’s ID tag is on his collar. Consider adding temporary tags with hotel information and travel phone numbers, a cell phone number or the phone number of a friend who will be home during your trip. Book dog friendly hotels, motels, and campsites early and make sure to tell them you are traveling with a dog. Find out what restrictions they have (such as crating all dogs, size limits, etc.) before you book your stay. Here are the basics to pack for your dog: A few of your dog’s favorite toys, food and water bowls, a leash, food, a first aid kit, medication, water, veterinarian’s phone number, dog’s medical records, blanket or king sized flat sheet, towels, poop scoop or plastic bags to clean up mess, garbage bags and paper towels (to clean up bigger messes), brush and comb (to remove stickers and burrs), and shampoo (for those emergency clean ups). Bring health and rabies vaccine certificates, particularly if you will be crossing the border into Canada, the US, or Mexico. All three countries allow dogs and cats to enter if they meet strict entry requirements. Keep to your dog’s regular feeding schedule. You can feed small amounts every few hours during the trip and plan his main meal in the evening or when you arrive at your dog friendly hotel or camp ground. Once at your dog friendly hotel, spend extra time in the room with your dog until he gets used to his new environment. When you leave the motel room, first try to leave for a short time to see how your dog acts in the room. You don’t want your dog barking and disturbing other guests. Leave the room vent/air conditioner and the television on while you are away to create some white noise and keep your dog company. Use a blanket or sheet from home (it was in your list of things to pack) on the bed to keep hair off the hotel’s blankets. Enjoy the time you spend traveling with your dog. We know he will. Obedient dogs make the best companions. Time spent training your dog will reward you with a pet that is deeply bonded to you, respects you and is a joy to have around. Training your dog doesn’t mean extinguishing her unique personality, it is simply a means of setting boundaries-something that makes dogs feel secure. You have lots of option as to how you go about training your dog. Libraries, bookstores and pet stores offer plenty of “how-to” training books. You can also find a lot of great information by surfing the Internet. If you prefer to have a professional by your side every step of the way, enroll in a basic obedience class. Major pet supply chains, humane societies and dog clubs usually offer classes. These classes are an excellent way to socialize your dog and educate yourself. If your schedule doesn’t allow you to participate in a class, check your community phone book for personal dog trainers. Most will come to your home on a regular basis, and provide in-depth training custom-tailored to your needs. They may seem to be bold explorers, sniffing at and mouthing just about anything, but all dogs have an instinctive fear of anything unfamiliar to them. Fear causes stress on the body, which affects long-term health. To help your dog avoid the negative health effects of stress, it is important to socialize her. Socialization is the process of exposing your dog to a wide variety of places, situations, objects and people. A well-socialized dog is a confident, healthy dog that you can take anywhere. The things that startle their dogs often surprise owners. Hats, balloons, garden statues, and other mundane things that seem to pose no threat. To your dog, however, it is an unknown. If you are a subdued person, your dog might show fear around a bubbly extrovert. Basically, any situation or object your dog is not accustomed to can create fear and stress in her. It is best if the socialization process begins when the dog is a puppy. This is a key learning time for dogs, so they become socialized more quickly. However, even older dogs that were not socialized as puppies can reach that confident, relaxed state. Socializing a dog that is more than one year old may take a little longer, but the results are rewarding. Socializing a dog is a very simple process: take the dog to as many different places as you can. Your dog will pick up on your body language and follow your lead, so it is important for you to act confident and relaxed, especially when your dog hesitates. While you are walking about, stop every so often to pet your dog and talk to her in a happy voice. Naturally, feeding her a treat or two will give her a positive association with the environment. At some point during socialization, your dog will plant her feet and refuse to budge or try to hide behind you to avoid a stranger. How you react in this situation sends an important message to your dog. If you pick her up or talk soothingly while you pet her, you are telling your dog that she is right to be frightened. On the other hand, if you ignore her behavior and go about your business—perhaps walking a different direction to distract her-her fear is not rewarded. Since your goal is to give your dog confidence, not traumatize her, never force your dog to accept a person or situation. Respect her feelings, and try again later. While you are out and about, remember that you are your dog’s guardian. Keep an eye out for excited children running towards your dog. A good way to handle this kind of situation is to stop the kids verbally about 10 feet from your dog. Explain to them that your dog is just getting used to new places and new people. Ask them to approach quietly and one at a time so that your dog learns that children are nothing to be afraid of. Letting the children feed your dog a treat is sure to help her learn to accept these high-energy, enthusiastic strangers.